Like notes playing across the staffs of music, the subtle lace eyelets of Sweet Melody Vest drift in and out of a flattering cascade of textured wavy columns. The slightly fluted lower edge is a nice touch, too. 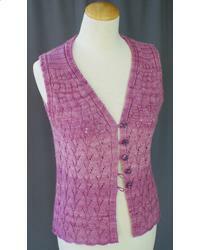 This vest is knitted as one piece so that sewn finishing is almost eliminated. You can leave the front opening buttonless or embellish with button loops and buttons as shown in the model for a center-front closure.